More users are enjoying the utility of Apple CarPlay and Android Auto™ every day. 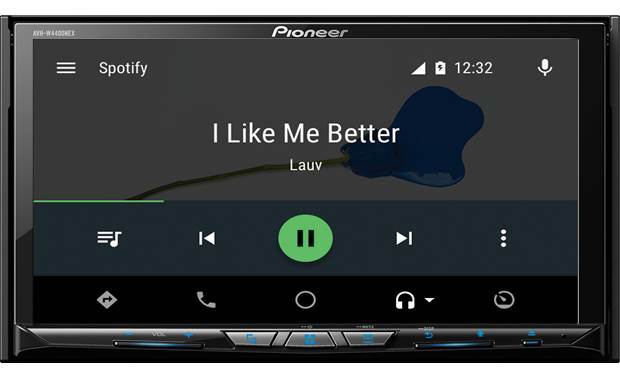 Pioneer AVH-W4400NEX - This receiver gives you the convenience of wireless Apple CarPlay and Android Auto. 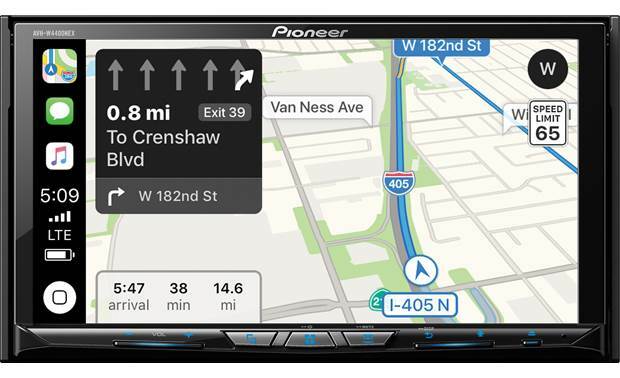 Pioneer AVH-W4400NEX - Save time with great directions from CarPlay or Android Auto. Apple CarPlay navigation pictured. 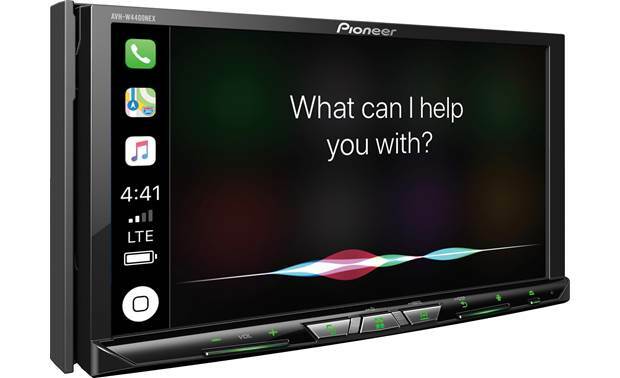 Pioneer AVH-W4400NEX - Apple CarPlay navigation pictured. 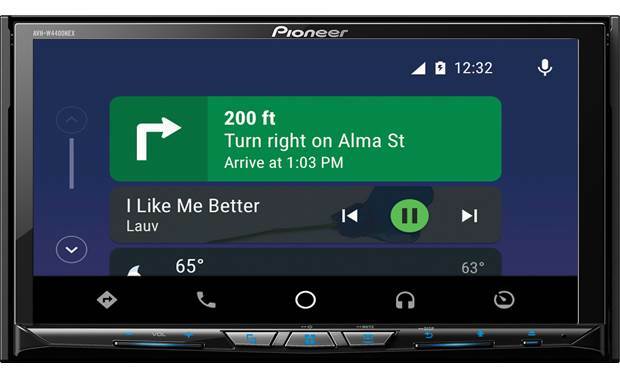 Pioneer AVH-W4400NEX - Android Auto navigation pictured. More users are enjoying the utility of Apple CarPlay and Android Auto™ every day. Now Pioneer's taken the convenience of these cool applications and made them wireless. No plugging in your phone — you're connected as soon as you start the car. CarPlay and Android Auto integrate your phone into your driving experience in a non-distracting way. You'll have voice control access to maps, weather, music, your phone, text messages, and easy access to many of your favorite apps — all without taking your eyes off the road. Customize the touchscreen by moving icons around to create shortcuts to your favorite sources and apps. And you've got a choice of colors and backgrounds that'll let you tailor the look to match your vehicle. Video content plays in bright, clear detail when you're parked, and when you're on the road, you can entertain your passengers by sending a movie from the receiver to a rear-seat screen. And of course you can plug in a rear-view camera (and a second camera) to play it safe in crowded parking lots. Pioneer's AppRadio mode and AppRadioLIVE offer some other cool features. Launch and control compatible iPhone apps from the face of your receiver with AppRadio mode. And for more functionality, download the free AppRadioLIVE app to your phone and you can sync many popular apps and services into a single, easy-to-use interface, giving you easy control over maps, media, news, and calendars. This Pioneer offers compatibility you won't find in many other aftermarket radios, thanks to the iDatalink Maestro module (not included). In a wide selection of vehicles, this module lets you keep factory features that you'd otherwise lose when you install a new radio. You'll also be able to check out engine performance data and other vehicle info on the Pioneer's screen. Once you've identified your vehicle, you'll see the iDatalink module offered on the way to the Shopping Cart if it's compatible. Crave the best sound quality? You'll be stoked that the AVH-W4400NEX supports FLAC file playback, for compression-free CD-quality sound when you're cruising down the highway. It will even play high-resolution FLAC files, if you have a speaker system that will do them justice. And don't forget, you can also enjoy all your CDs, DVDs, discs full of MP3 or WMA music, SD cards, or USB storage devices loaded with files. You can connect your iPod® or iPhone to one the receiver's two rear USB inputs and use the receiver's controls to access your playlists, with tools like Alphabet Search and Link Search to help you zero in on the song you want. Android users — you'll be able to browse and play back the music that's stored on many Android phones. The built-in HD Radio tuner delivers crystal-clear FM and AM reception from participating stations. If you're a fan of streaming Internet radio, you can take charge of your Pandora® account from the touchscreen, complete with thumbs-up and thumbs-down controls. For an outstanding variety of music, news, sports, and talk programming, you can also connect an optional SiriusXM satellite radio tuner. This NEX receiver will even display album art from the satellite feed. You can make the most of your music with this Pioneer's 13-band EQ. Just swipe your finger on the touchscreen to dial in the curve that brings out tones you're looking for. And you'll find digital time alignment, Auto-EQ, and other powerful tools for compensating for your vehicle's acoustics. If you currently use AppRadio Mode, Pioneer has found that it won't work with iOS 11. They're working on an update, so you may want to keep iOS 10 until that fix is available. The 4400NEX is an easy to navigate system. It works well. Huge upgrade to the 3.5" factory screen. Wireless CarPlay is awesome. Is there an external microphone that is used when placing calls? My concern is that a microphone integral to the unit would not pick up the driver's voice with enough clarity for the calls. It comes with external microphone as seen on the pictures available on Clutchfield. It would be up to you for optimum placement of the microphone. Good luck. 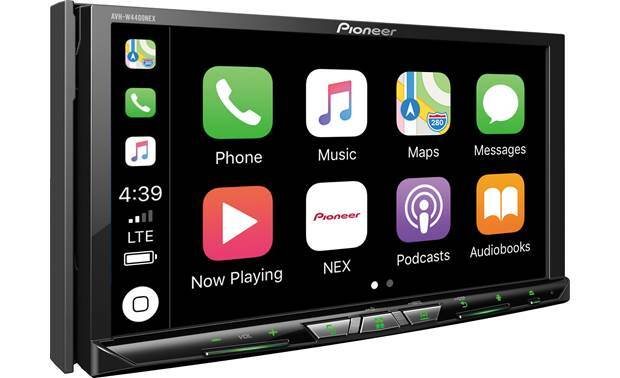 Built-In WiFi: The Pioneer AVH-W4400NEX features built-in WiFi wireless connectivity specifically designed to support a cable free connection between your Apple iPhone or Android smartphone and the receiver. Supporting both Android Auto Wireless and Apple CarPlay via a wireless connection, plus WiFi Certified Miracast wireless mirroring for older Android smartphone devices, you no longer need to worry about taking your smartphone out of your bag or your pocket before you get into your car. Note: The unit's built-in WiFi can only be used for Android Auto, CarPlay, and Miracast (not designed to be used with WiFi hotspots). 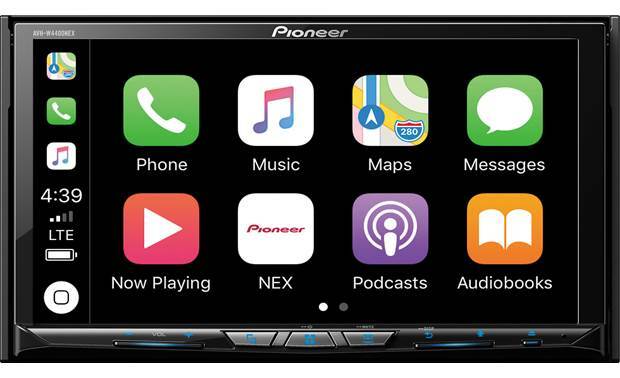 Wireless Apple CarPlay: The Pioneer AVH-W4400NEX features Apple CarPlay, the smarter and safer way to use your iPhone 5 or newer (iOS 7.1+) in the car. 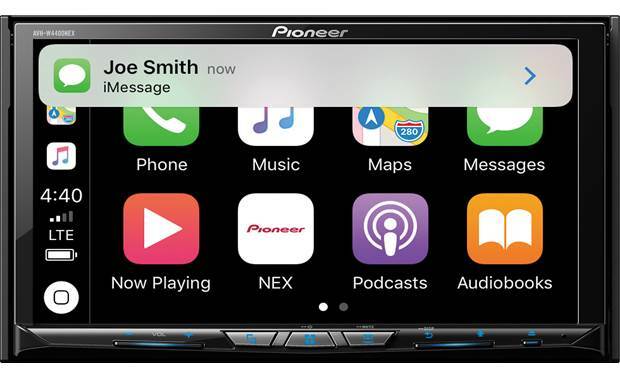 The Pioneer AVH-W4400NEX supports Apple CarPlay through a wireless connection using WiFi and Bluetooth (both connections must be made) or a hardwired USB connection using its rear-panel USB-1 port. Apple CarPlay gives iPhone users an incredibly intuitive way to make calls, use Maps, listen to music, and access messages through Siri voice control and the Pioneer receiver's touchscreen controls. Before using CarPlay, you will need to pair your iPhone to the receiver via Bluetooth and connect the phone to the receiver via a USB cable, or press and hold the "mic" button on the front-panel of the receiver, to make a WiFi connection between the receiver and your iPhone - follow the receiver's on-screen prompts. If you are using a hardwired connection, make sure to plug your phone into the USB-1 port. 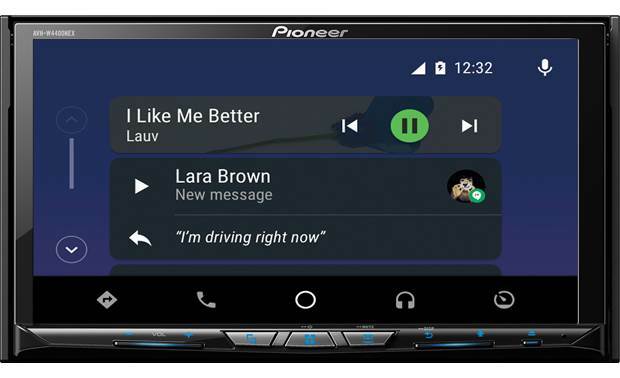 Click here to learn more about Android Auto Wirless compatible phones. If you are using a hardwired connection, make sure to plug your phone into the USB-2 port. AppRadio Mode+ (for iPhone & Android): The Pioneer DVD receiver features AppRadio Mode+ for Apple iPhones (iOS 9.0+) with Lightning connector and select Android (OS 4.4+) smartphones. AppRadio Mode+ gives you the ability to view and control compatible iPhone and Android smartphone apps from the receiver's touchscreen using a one-cable USB connection. You'll need to download Pioneer's AppRadio app (for Apple iOS 7.0+ / Android OS 4.4+) and the AppRadioLive app (Apple iOS 9.0+ / Android OS 4.4+) onto your compatible iPhone or Android smartphone. 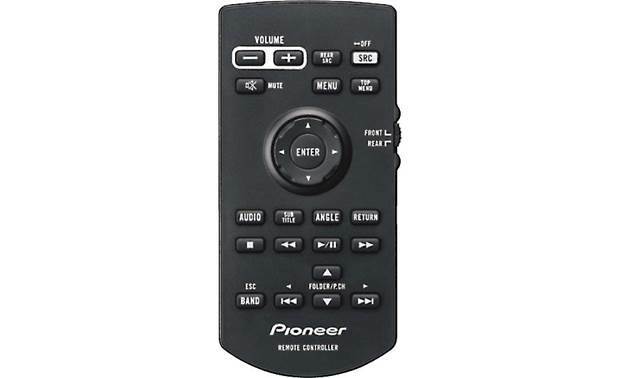 Once you have downloaded the apps, your compatible iPhone or Android smartphone simply connects to the Pioneer DVD receiver's USB input using the cable that came with your mobile device. Now that the AppRadio and AppRadioLive apps are downloaded, and your compatible Apple iPhone or Android smartphone is connected the DVD receiver, you have access to maps, media, news information, and your events calendar through the receiver's intuitive touchscreen interface. Maps: AppRadio Mode+, along with AppRadioLive use the native maps from your smartphone overlaid with INRIX live traffic data to provide live traffic and incident information to give you an estimated time of arrival at your chosen destination. Once you select your destination, you'll be guided along your route via an on-screen map and audible voice prompts. Selected destinations can also be sent to popular compatible apps like Navmii or Genius Maps. You can even use Yelp to find points of interest along the way, including restaurant ratings and reviews. Media: AppRadio Mode+ and AppRadioLive let you play your stored music library directly from your smartphone through the Pioneer DVD receiver. And, you can access over 60,00 internet radio stations from Radionomy. 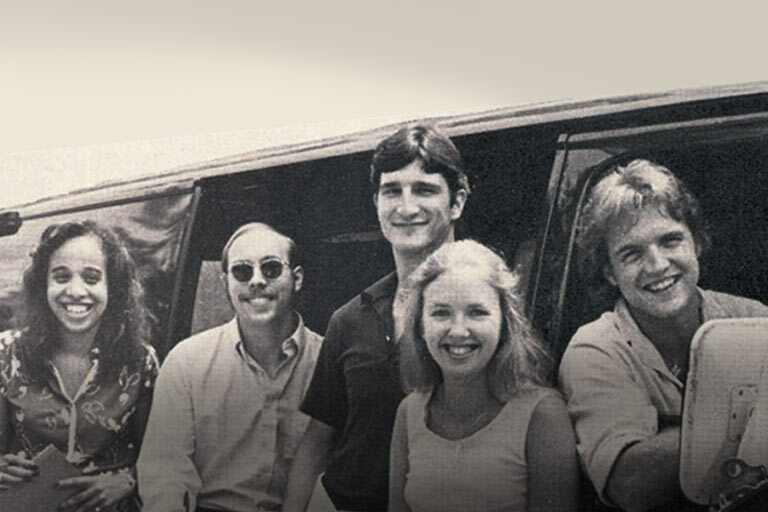 Or, you can access over 25,000+ radio shows and podcasts from your Stitcher account. Your compatible iPhone will need to be connected to the unit's USB 1 port. Your compatible Android smartphone will need to be connected to the unit's USB 2 port. Miracast for Android (Wireless Mirroring): Wi-Fi Certified Miracast lets you wirelessly send the display of your compatible Android OS 4.2+ device that also supports Miracast to the Pioneer receiver's touchscreen monitor. This allows you to view practically any content that is playing on your compatible Android device on the receiver's touchscreen (vehicle's parking brake must be engaged). Control will still be done from your Android device's touchscreen (not the Pioneer receiver). Click here to check for Miracast compatible Android smartphones and tablets. Miracast (wireless mirroring) will require that the vehicle's parking brake be engaged to mirror your smartphone or view any content from your smartphone on the Pioneer receiver's touchscreen monitor. Only audio content will be heard without the vehicle's parking brake engaged. iPod Direct Connect: The Pioneer AVH-W4400NEX's rear-panel USB port can be used to connect your Apple device with Lightning connector to the head unit. You'll need a Lightning-to-USB cable to connect your Apple device with Lightning connector to the head unit's USB-1 port. The USB connection allows for audio playback, music navigation, information display (including album art), and charging of your compatible iPhone or iPod. Audio Control: From the head unit's touchscreen, you can search your iPod/iPhone's audio content by Radio, Playlist, Artist, Album, Song, Podcast, Genre, Composer, or Audiobook. Once you have selected a category, you can search each category alphabetically (A-Z). In addition, the head unit offers Link Search, which allows you to play songs related to the currently playing song. Link Search lets the head unit create an album list of the currently playing artist, a song list of the currently playing album, or an album list of the currently playing genre. You can also select Random & Repeat functions for a certain song or specific folder. You'll still be able to control your iPod or iPhone from the device's touchscreen too. Note: The unit will only recognize up to 16,000 songs loaded on an iPod or iPhone. Not compatible with Apple iPod/iPhone devices with a 30-pin connector. Data Plan Required: Your iPhone or Android smartphone will need an active Data Plan account with connection to the Internet via 3G, EDGE, or LTE (4G) for CarPlay, Android Auto, & AppRadio to function. Access to CarPlay, Android Auto & AppRadio's online app services will depend on the availability of a cellular network for purposes of allowing your iPhone or Android smartphone to connect to the Internet. App services may not be available in all regions. Smartphone Charging: The head unit's USB connections provide 5V/1.5A of current to power and charge your connected iPod/iPhone or Android devices when your vehicle's ignition switch is set to the 'ACC' or 'On' position. If your mobile device has no initial battery charge, then the unit will not recognize it. GPS Antenna: The Pioneer AVH-W4400NEX comes with a GPS antenna to enhance the performance of Android Auto, Apple CarPlay, and Waze navigation maps. The GPS antenna comes with a self-stick pad which mounts it on top of your dash inside the vehicle. Smartphone Setup: Before connecting your smartphone device, you will need to indicate whether you are using an iPhone or Android smartphone in the Pioneer receiver's menu. 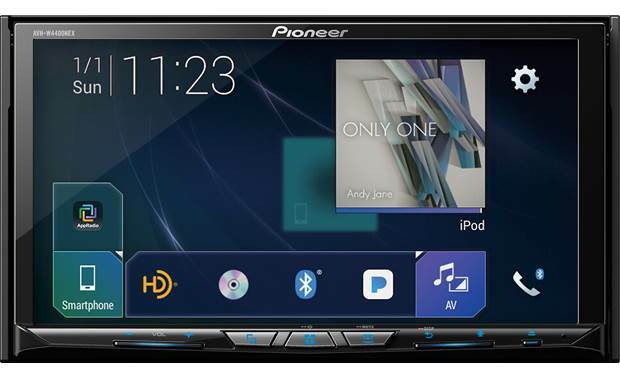 Note: Due to the differences in Bluetooth technology, some Bluetooth enabled devices may be incompatible, function improperly, or may not support all features when used with the Pioneer AVH-W4400NEX. Multi-Device Pairing Dual Phone Connection: Up to 5 Bluetooth-compatible devices (2 phones/1 audio player) can be paired to this head unit. You are even able to keep two Bluetooth-enabled smartphones connected at the same time, so you can switch between phones from the head unit's touchscreen, without having to connect or re-connect devices. SPP (Secure Simple Pairing): With Secure Simple Pairing (SSP), you can easily pair a Bluetooth enabled phone to the AVH-W4400NEX without having to enter pin codes or go through complicated settings. 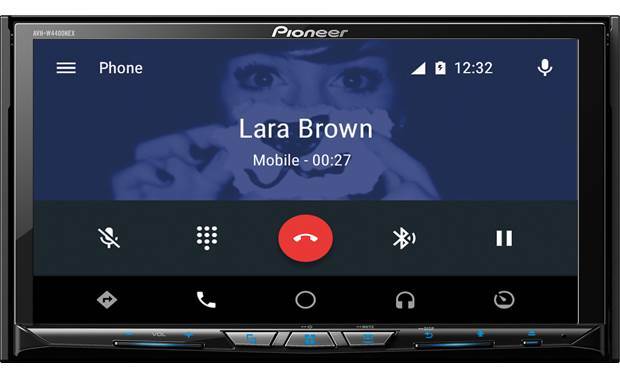 Hands-Free Communication (w/ External Mic): The Pioneer AVH-W4400NEX supports wireless hands-free communication for your Bluetooth enabled mobile phone. Thanks to the latest Hands-Free Profile (HFP 1.6) with wideband speech capability, the AVH-W4400NEX provides more natural sound quality and details during wireless calls. The AVH-W4400NEX allows you to carry on a phone conversation from your Bluetooth enabled mobile phone using the head unit's external microphone and your car audio speakers. During a conversation you can adjust the volume, as well as switch between the Private Mode (talking directly on your cell phone) and the Hands Free Mode. Making A Call: The AVH-W4400NEX offers a variety of ways to make call using the in-dash receiver. Call History: The 80 most recent calls dialed, received, and missed are stored in memory. You can browse them and call numbers from these lists. 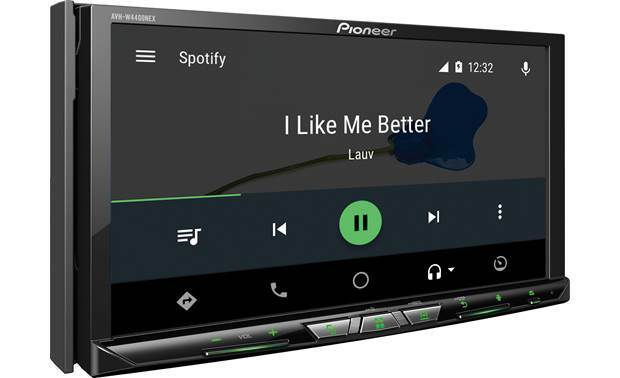 Wireless Audio Streaming: The Pioneer AVH-W4400NEX also supports wireless audio playback (AD2P) and control (AVRCP) of a Bluetooth enabled audio player or smartphone. The head unit can stream music stored on your Bluetooth enabled device or music apps you have downloaded on your device. When an incoming call or outgoing call is in progress from your Bluetooth enabled mobile phone, audio streaming will be paused so you can take your call. Advanced Music Navigation: In addition to basic playback functions (Play/Pause, FF/RW, Skip, Random/Repeat), the AVH-W4400NEX lets you browse your stored music by Playlist, Artist, Album, Song, etc.. (AVRCP 1.4 phones only; which includes Android 4.0+ and iPhone 5.0+). Siri Eyes-Free Functionality: When paired and connected to an iPhone with Siri via Bluetooth, the Pioneer AVH-W4400NEX has the ability to access Siri through its touchscreen and external microphone for Siri Eyes-Free functionality. 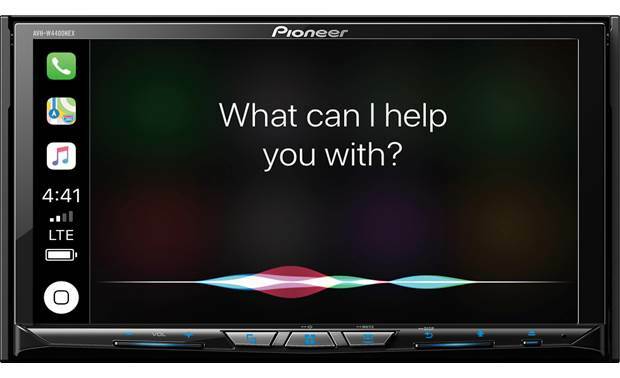 When activated, Siri voice prompts play through the vehicle's speakers and the user's commands and questions are received and transmitted to the receiver using the external microphone. Siri Eyes-Free provides access to many iPhone Siri functions such as music selection, making phone calls, and audible navigation (map will be displayed on iPhone); as well as listening to text messages, calendar information, and reminders. The head unit's audio is muted while Siri provides audible voice prompts. 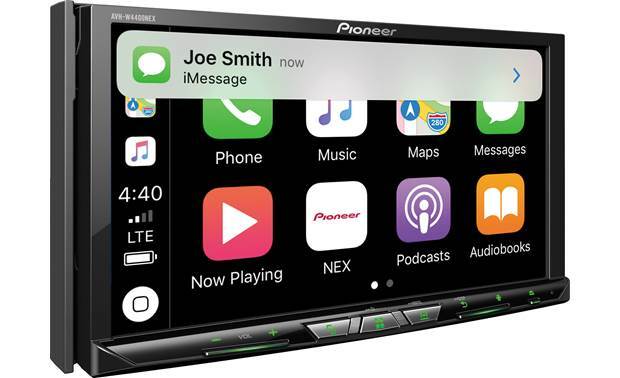 Note: The head unit's touchscreen monitor will only indicate hands-free calling and song/artist information (all other functions of Siri are only audible through the Pioneer AVH-W4400NEX; visual data will still need to be viewed from your iPhone device). Pandora Internet Radio: The free Pandora App (for Apple iOS 10.0+ or Android OS 4.0+) lets you play music from the Pandora music service through the Pioneer AVH-W4400NEX using your USB or Bluetooth connected Apple iPhone, or Bluetooth connected Android smartphone. Your iPhone or Android smartphone will also need an active Data Plan account with connection to the Internet via 3G, EDGE, LTE (4G), or WiFi. 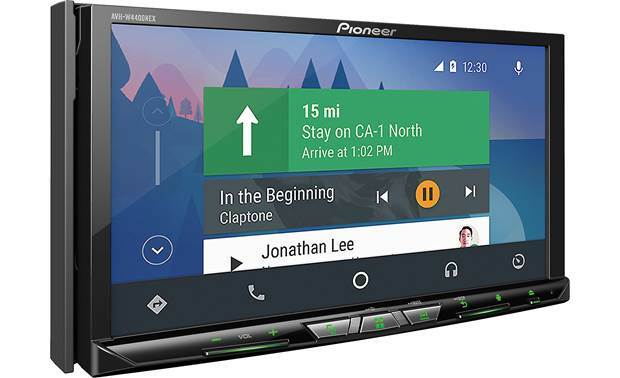 The Pioneer AVH-W4400NEX will provide control over the Pandora music service & display Artist, Album, & Song information; as well as Album art. SiriusXM 3.0 Ready: The Pioneer AVH-W4400NEX is SiriusXM 3.0 Ready so you can listen to commercial-free music, all your favorite sports, exclusive talk and entertainment, comedy, news, traffic, weather, and more. Simply activate a SiriusXM Radio subscription (fees will apply) and connect the SiriusXM Connect Vehicle Tuner (220SXV300, sold separately) to the dedicated port on the rear of the receiver for playback and control of satellite radio. Check out the most popular SiriusXM subscription packages here. HD Radio: The Pioneer AVH-W4400NEX's built-in HD Radio tuner lets you listen to the radio with the same fidelity as your digital music. HD Radio features high quality audio, FM multi-casting, and data services. With HD Radio, your FM stations offer near CD-quality sound, AM stations provide FM-like sound, and there is crystal-clear reception with no audio distortion. Best of all, HD Radio is 100% subscription free. The unit's tuner also supports analog AM/FM broadcasts. Reception Blending: If a digital broadcast reception condition gets poor, this unit automatically switches to the analog broadcast of the same frequency level. If this function is set to "On", the tuner switches between digital broadcast and analog broadcast automatically. If this function is 'Off', reception will be conducted within an analog broadcast. Compatible Discs: The 6.94" touchscreen display electronically slides down to load and eject your DVD/CD discs. The AVH-W4400NEX supports playback of DVD-Video, DVD-R/RW, CD-Audio, and CD-R/RW discs with video, audio, and photo files. Dual USB Ports: The unit's dual USB ports and 58" USB extension cable allow you to connect a USB Mass Storage Class (MSC) device, such as USB thumbdrive or portable digital music player. The USB port enables playback & control of music, video, and photo files stored on your portable USB MSC device through the Pioneer AVH-W4400NEX. USB devices that can be charged via USB will be charged when plugged into the receiver's USB ports (1.5A) and the vehicle's ignition switch is set to ACC or On. Note: Connection of a USB hub or card-reader is not supported. Connection of AOA & MTP devices are not supported. 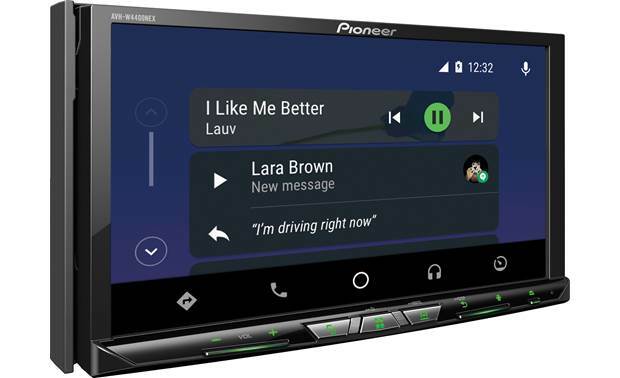 SD Card Slot: The Pioneer AVH-W4400NEX features a hidden SD card slot (located behind the motorized touchscreen monitor) which will accept SD (up to 2GB) and SDHC (up to 32GB) memory cards for playback of a variety of music, video, and photo files. Compatible Media Files: The Pioneer AVH-W4400NEX supports the following types of audio, video, and photo files recorded onto a disc, USB device, or SD memory card. Advanced Playback & Search Functions (for USB & SD/SDHC): Advance playback functions include; Music Browsing which lets you browse your USB & SD/SDHC memory device's music library by Artist, Album, Song, or Genre from the head unit in alphabetical order; and Link Search which allows you to play songs related to the currently playing song. Link Search lets the head unit create an album list of the currently playing artist, a song list of the currently playing album, or an album list of the currently playing genre. Direct DVD Search: During DVD playback, you can go directly to a specific Title or Chapter by entering the number using the unit's touchscreen numeric keypad. 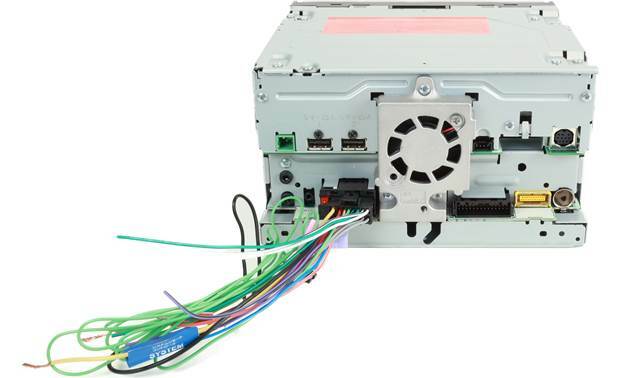 Parental Lock: This unit features an 8-level Parental Lock system protected by a user-selected 4-digit password to prevent certain DVD's from being played back on the AVH-W4400NEX. 24-Bit/192kHz DAC: The Pioneer AVH-W4400NEX is equipped with a 24-bit/192kHz digital-to-analog converter for superb quality audio playback from disc, USB, iPod/iPhone, Android, and Bluetooth. MOSFET50 Internal Amplifier: This receiver is equipped with a 50 watts x 4 (peak) MOSFET amplifier for low distortion, high power output. The amplifier is strong enough to power small subwoofers to moderate volume levels in compact cars and pickups. For higher volume levels from subwoofers, an optional amplifier may be connected to the preamp outputs. Note: The power specifications for the AVH-W4400NEX are compliant with the CTA-2006 Mobile Amplifier Power Testing and Measurement standards from the Consumer Technology Association (CTA). These standards were developed as a way to equitably compare power specs from model to model and between manufacturers. 4V/6CH Preamp Outputs + Sub Control: The Pioneer AVH-W4400NEX features three pair of 4.0-volt preamp outputs (Front/Rear/Subwoofer). The unit's front and rear preamp output can be faded (front/rear), while the subwoofer preamp output is non-fading. The Pioneer AVH-W4400NEX lets you adjust the subwoofer preamp output's phase (normal/reverse) and volume (+6 to -24). Crossovers: The AVH-W4400NEX employs high pass and low pass crossovers to tailor the head unit to your connected speakers. HPF: The head unit's variable 6/12/18db per octave high pass filter only allows frequencies higher than those in the selected range (50, 63, 80, 100, 125, 160, or 200Hz) to your front and rear speakers through the unit's speaker-level or line-level outputs. LPF: The subwoofer preamp output features a 6, 12, or 18dB/octave low pass filter so only frequencies lower than those in the selected range (50, 63, 80, 100, 125, 160, or 200Hz) are output to your connected subwoofer. Auto EQ (Optional): The auto-equalizer automatically measures your car's interior acoustic characteristics, and then creates an auto-equalizer curve base on that information. The Pioneer CD-MC20 Auto-EQ microphone (130CDMC20, sold separately) is required to use this function. 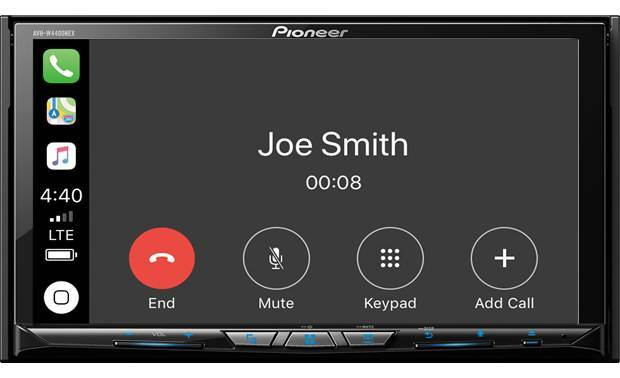 The Pioneer CD-MC20 Auto-EQ microphone plugs into the Pioneer receiver's "Auto EQ Mic" 3.5mm jack located behind the motorized touchscreen monitor. The Auto-EQ microphone should be placed in the center of your vehicle's driver seat headrest facing forward for EQ measurement. Source Level Adjustment (SLA): This function lets you adjust the volume level of each source (AM, Pandora, iPod, Apps) to prevent radical changes in volume when switching between sources. Settings are based on the unit's FM volume level, which remains unchanged. Each source can be independently adjusted from -4 dB to +4 dB. Bass Boost: There is also a Bass Boost level adjustment that be set from 0 to 6. Key Beep: The in-dash head unit provides an audible beep to confirm button operation; this can be turned On or Off. Dual AV Inputs: The Pioneer AVH-W4400NEX has dual AV inputs to connect two external audio/video sources. The head unit has a rear-panel 3.5mm minijack AV input for connecting a portable audio/video device. There is also a rear-panel composite video/stereo RCA AV input for connecting a video component such as a mobile TV tuner or game console. Note: For safety reasons, video images from the AV inputs cannot be displayed on the receiver's touchscreen monitor without the vehicle's parking brake engaged. HDMI Input: The Pioneer head unit's HDMI input can be used to connect an iPhone/iPod touch with Lightning connector (using an Apple AV adapter - sold separately), an Android smartphone/tablet (using a MHL adapter - sold separately), Blu-ray player, TV tuner or game system. The HDMI input will provide video and audio playback. Playback functions will need to be controlled from your HDMI-connected device (not the Pioneer head unit). Note: For safety reasons, video images from the HDMI input cannot be displayed on the receiver's touchscreen monitor without the vehicle's parking brake engaged. AV Output (w/ Dual Zone): The unit features a composite video jack and 3.5mm audio jack to output AV signals to an optional monitor and headphone system. You can simultaneously enjoy the same or different sources in the front and rear of your vehicle. The unit's dual zone AV output can be set to Mirror, Disc, AV-In, USB-1, SD, or Off. The Mirror mode simply outputs the same audio/video signal (not including USB-2, HDMI, Miracast, AppRadio, CarPlay, or Android Auto) which is playing on the head unit's touchscreen monitor to your connected rear monitor/headphone system. Note: USB and SD cannot be selected for playback in the rear of the vehicle when CarPlay or Android Auto is active. 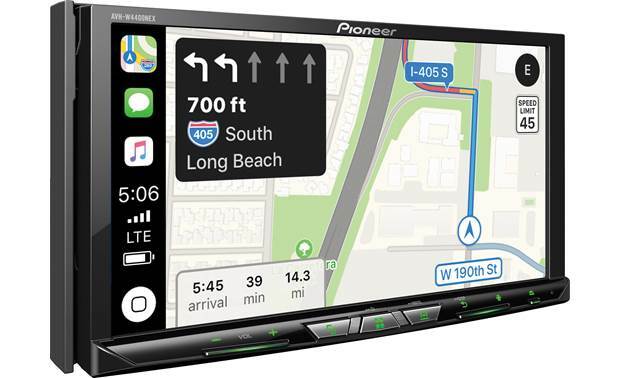 Navigation Ready: The Pioneer AVH-W4400NEX allows you to connect the Pioneer AVIC-U280 add-on navigation unit (130AVIC280, sold separately) through its RGB Input. This versatile hideaway unit allows you to switch to navigation mode with the touch of a button. Get to your destination by inputting an address or search through the POI library while enjoying whatever source is currently playing. iDatalink Serial Port: This Pioneer DVD receiver is compatible with the iDatalink Maestro RR (794ADSMRR, sold separately); a web programmable module that will permit the aftermarket Pioneer receiver to work with select Ford/Lincoln/Mercury vehicles that feature the factory SYNC system, select GM vehicles with factory OnStar, select Chrysler/Dodge/Jeep vehicles with U-Connect, plus select Honda/Acura, Toyota/Scion, Volkswagen & Subaru vehicles with factory digital amplifiers. Retained Features: The Pioneer DVD receiver lets you retain select factory functions. Retained features will vary by vehicle via the iDatalink Maestro RR. Retained proprietary factory systems can include Ford Sync, GM OnStar, and Chrysler/Dodge/Jeep U-Connect. Other retained factory features may include Steering Wheel Controls, Aux Input, USB Port, Hands-Free Bluetooth, Voice Commands, Satellite Radio, Secondary Display, and more. Motorized 6.94" Clear Resistive LCD Touchscreen: The Pioneer AVH-W4400NEX features a 6.94" clear resistive LCD touchscreen with a display resolution of 2520 x 480, for a total of 1,209,600 pixels. The clear resistive panel is designed to enhance the visibility of on-screen graphics and images, making them appear clear and crisp. 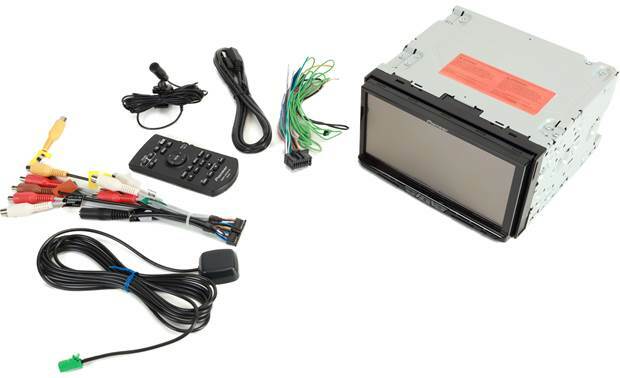 The LCD touchscreen allows you to control this unit and a connected component - such as an iPhone, Android smartphone, a USB MSC device, or Bluetooth source. Menus appear on screen for making function choices, audio adjustments, and setting up the system. The unit's 6.94" touchscreen display is motorized and electronically slides down to load/eject your DVD/CD discs. The angle of the motorized touchscreen display can also be adjusted to five different positions to meet your viewing needs in the car. Favorite Menu: You can register the desired menu items on the AVH-W4400NEX's "Favorites" menu screen. Registering your favorite menu items allows you to quickly jump to the registered menu item by a simple touch on the favorites menu. Up to 12 menu items can be registered as a "Favorite". Background (Wallpaper): You can select between a variety of preset background (wallpaper) images for the Menu screen and AV operation screen. You can also download a custom image (maximum 4000 x 4000 pixels) from a USB storage device or SD memory card. Note: In addition to the touchscreen controls, the unit includes frequently used push-buttons along the bottom edge of the screen. Detachable Face Security: The Pioneer AVH-W4400NEX's 6.94" touchscreen monitor can be detached from the chassis to deter theft (soft carrying case included). You can also enter a 5 to 16 character password that must be entered if the head unit is disconnected from power. Variable Color Illumination: You can adjust the color of the on-screen display; choose between red, amber, green, blue or white. The color of the button illumination can be set to red, amber, green, blue, white, or scan (constantly cycling through the color spectrum). You can also create a custom color for the unit's button illumination to match your vehicle's interior lighting (112 colors to choose from). Remote Control: The Pioneer AVH-W4400NEX receiver comes with an IR wireless remote control, plus support for factory steering wheel control (adapter sold separately). Wireless Remote Control: The Pioneer AVH-W4400NEX includes an IR remote control for wireless operation of the multimedia head unit and your connected devices. Parking Brake Interlock: This unit has a parking brake interlock system that prohibits viewing of video and operating certain controls when the vehicle is in motion. In order to watch video on the in-dash monitor, the vehicle must be stopped with the parking brake engaged. The head unit's light green wire must be connected to your vehicle's parking brake detection circuit. The head unit's touchscreen will display "Attention! Viewing of front seat video source while driving is strictly prohibited", if you try to watch a video when your vehicle is in motion. Note: CarPlay, Android Auto, and AppRadio do not require that the parking brake be engaged. yes, you have to install the mic, included. I put mine on the driver windshield visor, on the left corner, ran the wire through side trim, so it's very unnoticeable. Works amazing and very clear, I had feedback that my voice sounds like I'm in sound proof room. Microphone is external and it picks up voices with no background noise. Almost a noise cancelling microphone. Have had no issues or feedback from folks I have talked with through the phone system on the radio. Yes there's an external microphone mic that you can mount on the visor or somewhere else. There is an external microphone that runs out the rear that you mount in the car. It's not a mic on the unit itself. It won't work with your factory mic most likely. The mic works fine and calls and voice commands are clear. An external mic comes with the unit. I have mine mounted to the sun visor. No issues with people hearing me. Yes, a wired microphone is included. Yes. Has a great external microphone. Yes, there is an external mic with a long cord. It sounds very clear and can be hidden in a variet of places. Yes, there is an external microphone that can be installed at a better location. There is a microphone provided that can be mounted in an area of your preference. Mine is installed to the right of the steering wheel adhered to the dash. There is some adjustability so you can adjust the "aim" Mine is held in place with circular Velcro mounting pads. Note that you'll have to conceal the wire if that concerns you. I personally don't care about that little wire, but others may. ( 2006 Prius ) Peace and prosperity?????? ????? Yes, it uses an external microphone with a long wire. I ran mine up the drivers side A-frame and clipped it to the sun visor and still had wire to spare. I don't believe there is an internal microphone on the head unit. I've been told it's clearer than the original mic in the car. Yeah! This head unit works with iPhone XR. You can use Apple CarPlay as well! Yes. It works with my XS no problem, fully wireless CarPlay. Does this unit have the option to load custom boot screens? In looking at the manual, I don't believe you can. But you can load your own background wallpaper from a USB drive. The boot screen is only displayed for a second or so. Yes! Mine is using a nice photo of my WRX as the boot screen. I have a custom image loaded, but not a scene. Does this unit have the option to load a custom boot screen? It does have the ability to load a custom image for the splash screen when the system turns on. I loaded the logo for my truck with no problem. Yes it does. I have a custom boot screen on my unit. Will this unit work with iPhone XS Max? Yes it works well with the XS Max. Yes, that is my primary phone and it works fine for me. Yep! I have that phone and it works seamlessly with this unit and wireless CarPlay. Yes, been using it the entire time I've had my XS Max at launch. If I'm driving and listening to the radio and someone calls my phone will it ring through the system and give me the option to answer and talk through the car microphone and speakers? Yes, that feature works well. Yes. It you are on carplay it will display the carplay ring screen and if you are on bluetooth only it will just display the bluetooth ring screen. Yes, as long as your phone is connected via BT, USB, ect. Yes. Works well, sound is good and the caller can hear you clearly. It automatically lets you answer through your car using Apple CarPlay. I'm sure it does the same for Android. It comes with its own microphone and uses the car speakers to listen. I assume you mean am/fm radio. It will mute the radio. Allow you to answer your call and talk through the mic and speakers. When the call ends you will be returned to the radio station you were listening to. If the source you were listening was streaming, i.e. podcast, Spotify, etc. it will pause and then start from where you left off when the call came in. If using Apple CarPlay Siri will read your text messages to you and will dictate a reply. If it is installed correctly and your phone is connect via bluetooth then yes it will. Are these brand new radios.. or refurbished ones?? Mine was new. I'm sure if they were selling refurbished they would list it as such. Will it connect to iPhone automatically without touching anything when reentering the vehicle? If not, what is the process for it to reestablish the connection? Yes, as long as you do not use remote start of your vehicle. If you're in the vehicle when you turn it on, it's an absolutely awesome experience. If you remote start, it's super frustrating to get it connect and I usually have to plug in and use the wired connnection. Yes, and the audio will pick up right where it left off (if you were playing something). If you configure a wireless connection, yes it will connect automatically. You don't even have to take your phone out of your pocket. That being said, I used wireless first and found it to not be as reliable. Now I use the USB connection and like it much better, but you don't get the luxury of auto connect. Unfortunately I do not own an iPhone. It will connect to my Android phone via Bluetooth every time I enter the vehicle. However works Android auto does not work, they is because not all Android phones have been updated to work. It will connect to iPhone automatically. It will connect automatically without touching anything. And if your iPhone still has your music app open it will pick up where you left off. If it doesn't reconnect automatically (which happens occasionally) you press the phone icon on the home screen and select your iPhone and it will connect. Yes. You need to set it up the first time then everytime the car starts it will auto connect. Don't get the 4400. I had issues since day one. Works with apple but not Android. Does this support iPod Classic? The details say no but I've heard others say that they have heard it works. I can't confirm these claims. I don't know; I use an I-Phone X, the whole system is great! The SD card in mine keeps cycling thru all the songs and wont stop on one? Put the songs on the root of the SD card without folders. You may also want to format the drive first. I use a USB drive instead of a SD card. Does it have a scan feature for analog & HD radio? It does scan my local analog stations. Does music continue to play when the front camera is displayed? Does the front camera display momentarily after shifting from reverse like on similar Kenwood models? The music will continue to play. No on the second. I have this unit in my Tundra and my wife's CRV and neither does that. . When switching to reverse the display will change to the rear view camera and the music will still play. Could a driver run his Uber / Lyft app from the unit? Not exactly. You will still need a phone to run the driving app. From the driving app if you select Google Maps or Waze as your preferred navigation it will then display the navigation for your Uber or Lyft ride on the head unit. Can you still use wired Android Auto or does this support only wireless Android Auto? I cannot speak to android, but for Apple CarPlay you can turn off wireless and use plug-in only. It's a great unit. I would recommend it. It supports both wired and wireless. You can still used wired Android Auto with this. Both work just fine. Wireless used more phone battery. Wired will charge your battery. You must plug the USB cable into Port 2 on the back of the head unit. Port one is for Apple play. Wired is supported. A wire is provided with a USB receptacle that can be connected to the back of the system for either CarPlay or Android during installation. 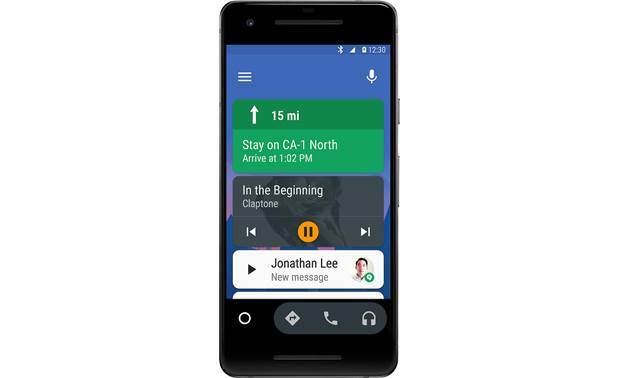 Does wireless Android Auto work will all Android devices or just Google Pixels? I have a Samsung S7 Edge running Android 8.0. All android devices and I'm sure Galaxy devices has the view cast that show videos also. Have a Samsung S9+ and it does not work with my phone. Hoping they update sometime. I have the S8 and the other half has a S9 and wireless AA doesn't work. No it does not. I found out the hard way by not doing enough research. Wireless only works with the pixel and nexus phones. I have a question regarding the random playback feature when using a USB memory device. Does it only play songs in one file randomly or will if randomly select songs from all files on the memory device? I listen to music from my usb drive all the time. I have the music in different folders to help me keep track of them. If you play music on the shuffle or random setting it plays music from every folder on the drive. 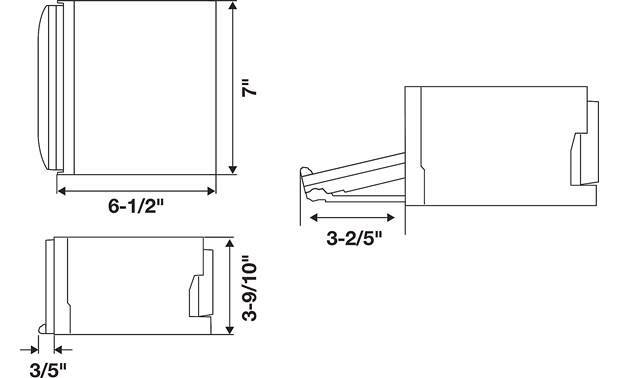 Is this unit a direct fit for an 03 tacoma without modifications to the dash? Will it play blu-ray dvds with out hooking up an external blu-ray player using the hdmi ?? I also was wondering about the product depth. Right now it says it will not fit my vehicle (2012 GMC Sierra) however this module is the same exact size as a previous model which does fit my vehicle. So it should fit then? I believe it says that because the Metra dash kit will make the models with the removable faceplate catch when ejecting a DVD disc etc. However, if you play with the positioning in the face plate you can make it work fine. It fit my 2007 Yukon XL Denali just fine, although if you use the USB plugs you might have cut to get them to fit or use USB angle adapters so the plug doesn't extend to far from the back of the radio. Your fit guide says this will not fit my 2011 Chevy Avalanche LTX with navigation and Bose. Other suppliers say it will fit. What's the truth? I want to install this in a 2018 rav4 Limited Hybrid. Currently I use Entune Premium with navigation, which is Toyota. My question is can I use the camera and microphone that are already installed or do I need new? Can't help you on this one. You would be better working with a Crutchfield Advisor. The microphone function does not retain. You will have to use the included microphone with the radio. However, if you buy the adapters then the steering wheel controls & factory reverse camera will work. With an idatalink likely yes for the cam, probably no for the microphone. Most cars have a factory active microphone, the Pioneer head units use a passive one. Ask an adviser to be sure. Does this have Parking guidelines on the backup cam? Yes but you can turn them off. Dont get camera I have had it almost 2 months and it stopped working. That would depend on the car the radio is installed in. My car is a 2014 Toyota Camry and the lines are part of the camera not the radio. No, it does not. Kind of annoying they remove it away. It can be turned on and off depending if your camera come with the lines. That would depend on the camera, not the head unit. Actually, after double-checking with our research department, they stand by the posted depth. Apparently, the Pioneer provided USB extension cable protrudes from the back of the chassis adding to the overall mounting depth. My apologies for any confusion. I hope that helps. How much time will it take to install this for someone generally handy? Is it an afternoon project, or all weekend? Thanks! It's definitely more than two or three hours if you've never installed a stereo before. This is the first unit I had ever installed in the car, and it took me two afternoons. Get the wiring harness take your time. It's not hard, just may need to take your time. Crutchfield help is awesome. My buddy and I installed it within 3 hours. As a fellow "generally handy" guy, it took me under an hour... and that was with soldering my connections to the harness. ARE YOU BUYING A READY HARNESS? ARE YOU WIRING YOUR OWN HARNESS? LESS THAN AN HOUR FOR A READY HARNESS, OR AN HOUR TO A COUPLE HOURS FOR WIRING YOUR OWN HARNESS. DEPENDS ON YOUR WIRING SKILL AND KNOWLEDGE. First of all, I don't recommend the 4400. Mine had never worked wirelessly, and now no longer communicates with Android at all, and is intermittent with my wife's iphone. The install was fairly easy, but the wiring diagram had some errors. Crutchfield help line was very good. This install is a challenge, I am experienced and it took me a few days, but it turned out great. This stereo has everything you could want. It has a lot of wires and prep you should look after to get this one right, I love this product though. It has not been installed. I am havng a local shop installing the unit. I can let you know once the unit is installed. If you have everything you need (i.e. dash kit, harness adapter) for your application, it shouldn't be more then a few hour job. Does this unit supply sufficient power to its USB output to charge an iPhone during use? I read a report somewhere about difficulties in that regard. It does. I use an iPhone X Max and it works just fine. You have to unlock the phone first, the first time you connect with an accessory. That may have been where the person had difficulty? Mine has powered my iPhone X while running music and maps, with the screen on, and using Carplay. It even charged my phone while doing all this, not just sustaining it. I have the USB extender plugged into the back of the unit. I am pretty sure it does. I use Android auto all the time and my phone is always fully charged at the end of my trip. While I don't have an iPhone, the Android phones charge well during use. I connected the God antenna but I can't seem to access the internet maps. How do I get the gps/maps to show on the screen. I was told this comes with navigation already installed. And I can't seem tobe be able to mirror myphone phone to the radio. My phone does not seem to be Alberto discover it even while its connected to Bluetooth. Is there so egging I'm missing? The W4400 doesn't have navigation. It uses the navigation off of your phone. If you're using an iPhone - enable car play and you can choose between Waze - google maps and apple maps - as long as you're running iOS 12.0 or higher. If you're using an android - get app radio (pioneers app) and you can use google maps off of you're android. Several videos on YouTube that can show you how to set it up. Can you listen to Pandora simultaneously while using Apple Maps through CarPlay? I use Android auto. I can listen to music from any app while using Google maps for directions. They work at the same time just fine. I don't use carplay, I use andriod auto and I can listen and use Google maps at the same time. But I'll tell you this, this receiver is extremely glitchy with andriod wiresless. I'm thinking about trying a Kenwood. It works differently every single time I use it. You can with Android Auto. I'm guessing it will be the same on the Apple side. I used to have a pioneer that would show song names and nes related text in gray on sirius xm, is that still the case on new HUs by pioneer? I don't use that service, I use Spotify and song names appear on that. But that's apple car play, not sure that's a relevant answer? Hope so. Yes, you'll get name of song and artist. We've had these in both cars for about a week now, and live it! The wireless Apple CarPlay works great. I didn't hook up the xm radio on mine yet. (Still deciding if it's worth paying monthly fee) but using HD radio, spotify and pandora, all will show artist and song title. Most will show album art as well. I would assume XM radio has the same features. Can you access the Google Assistant by saying hey Google? Yes, you can. There is also a button on the face of the unit that gives you access to the Assistant. Have not try that yet... but sure it work "hey siri..." I use and iPhone X. It works when I ask Siri, not sure if google works, but why not? I have not tried it with an Android phone, but I can say "Hey Siri" while connected through Apple Car Play and it works. It even works while a loud song is playing so I expect that the same will happen with "Hey Google"
According to Pioneer you can. I use an Iphone and can use Siri on my unit. There are youtube videos showing everything you can do with this unit. I suggest you watch one or two before buying. Yes, you can use google assistant with this head unit.Since its wireless Android Auto you never have to take your phone out of your pocket or your bag to use it. Can you access the Google Assistant from the steering wheel? You can with the appropriate hardware to access the steering wheel buttons. Yes you can add navigation. This unit comes with the navigation antenna, you just have to add the nav unit. Pioneer has the nav unit required. I use my google map app with Apple car play myself. Yes this unit came with a GPS antena. There is a module for about 300$ that can be added later that will give the unit built in navigation. This is a nice unit, my favorite aspect being the wireless car play. It has a port in the back for the Pioneer AVIC-U280. However, it comes with a VSS wire and GPS antenna to help with tunnel and lost signal navigation. You can also use your phones navigation system or app (Waze/Google Maps) when you plug it in or connect wirelessly. I personally plug in my Samsung S8+ AND use Android Auto with Waze. The only difference between the 4400 and the 6400 is that the 6400 is payware navigation with all the perks (tons of locations, lane assistance, etc). The 4400 had a detachable face and SD card support. I'm happy with the 4000. Will this require an antenna adapter that goes into the antenna receiver and a wire into the power antenna for a 2004 Honda Civic sedan? We found the stock AM/FM antenna in your 2004 Civic to use the standard "motorola" style connector that will plug directly into any aftermarket stereo. So, no, you won't need an antenna adapter. 2017 Tacoma -- Can I use my factory microphone or do I have to use the clip-on provided with the head unit? I checked the Tacoma forums because I have a 2018 4Runner and did not want some stupid clip on microphone in my brand new car. I found a kid who was making factory spec microphones for the unit that clip in EXACTLY where the original one is. People said it sounded BETTER than the original. When I installed the stereo I just unclipped the factory, and clipped his in place. He made the body of the microphone with a 3D printer. Did you end up getting it to work with your original microphone? I could not figure out a way to use my vehicle (Chrysler) microphone so I had to use the one in the box. When I removed my factory head unit, there wasn't a dedicated microphone wire that I could find. 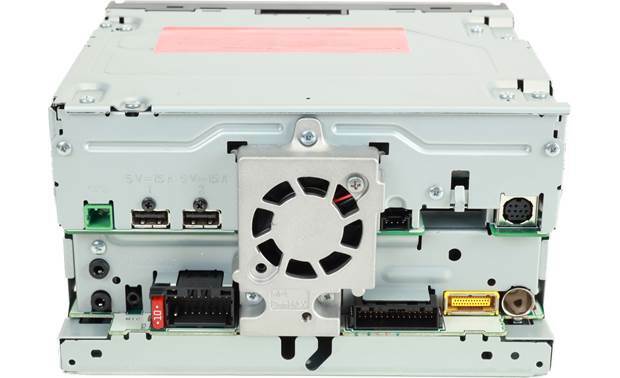 Is this unit compatable with the OEM rear entertainment in 2004 ford excursion? Also, is it compatable with the steering wheel controls? Don't know. Try it in a Toyota and it works like a champ! I have a convertible. Will the screen be unreadable in the sun? Is there a better screen option? What is the physical size of the remote? It is a resistive touch screen that is non-glare kind if like a Garmin. The higher end models have the capacitive touch screen that might glare more. The brightness level is pretty good and very adjustable along with the previously mentioned angle adjustment so you'd probably be fine but I don't have first hand use in a convertible. It has a motorized adjustable screen for you to change the viewing angle. I don't think you'll have trouble reading it in the sun. It's not a glossy screen. I don't have the remote in front of me but it's about 1.5" x 3". ABSOLUTELY....Works beautifully. Turns the unit in to an Android computer! And the Pioneer touch screen controls Android. No longer necessary to use the Host screen. Yes it does. I have not implemented it myself on my unit. It supports Miracast for Android and using a HDMI cable for Apple. You should do some research to see if your phone is supported. There are some you tube video's that explain and show how to do it. Does it support screen mirroring with android? Yes but does not work for all android phones. But it definitely works for google phones like the pixel , pixel 2, XL models. It does. It's supports mirrorlink and android auto. How can I use my factor Sirius Xm antenna on this unit? So I donâ? ?t have to buy a new Sirius xm antenna trying to save some dough. This unit does not have a built in Sirius XM tuner. You have to purchase the tuner separately, which comes with the antenna. How can I use my factor Sirius Xm antenna on this unit? So I don't have to buy a new Sirius xm antenna trying to save some dough. Have to buy separate xm tuner. Will the back up camera still work if this is installed in a 2013 civic SI? It worked fine with my 2015 Toyota Camry's built-in backup camera. Originally Crutchfield's tech support said no, but when I called back I got the correct information that it can. If it's an factory camera you might have to get an adapter but it's an aftermarket one it will be fine!! It should. All the necessary hookups for stock and free market back up cameras are present. I just replaced an older Puoneer deck and the old back up camera works perfectly. Why does this radio come with a GPS antenna if it doesn't have built-in navigation? Is it even worth hooking it up during installation? Android auto/ Apple Care Play uses it to determine if you are moving. It's part of how Android Auto/ Apple Car Play works. You can also plug the factory gps antenna on the Toyota Tacoma to the Pioneer. 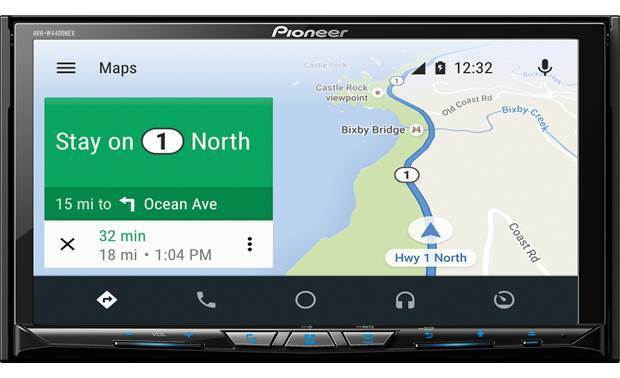 The Pioneer AVH-W4400NEX comes with a GPS antenna to enhance the performance of Android Auto, Apple CarPlay, and Waze navigation maps. You will find this information, and more, by clicking the "Details" tab on the stereo's main webpage and scrolling down below the "Features & Specs" table. Does Pioneer AVH-W4400NEX have built-in back up camera guides? Thank you. Im not sure if it's built in. I say that, after installing we have the exact same lines we had before. The stereo does not provide any parking guidelines. If you want parking assistance guidelines, you can get them built into the rear-view camera model you connect to the stereo. I have a Dodge Ram 1500 with a factory installed backup camera. Will one of your wiring harnesses allow this unit to utilize the factory camera? My car doesn't have a speed wire I was wondering if there was a way to bypass that so I could use Android auto? The stereo's Android Auto function automatically works in hybrid mode if it doesn't detect a speedwire connection. Skip the parking bypass for this model... it works, but then is overridden by the GPS antenna detecting the car in motion. You don't need a speed wire. Just hook up the GPS sensor (included) and it does a hybrid calibration. To use Carplay, is it necessary to tap "OK" on the legal disclaimer screen every time before you can use it like it does on my AVH-4000NEX? My Carplay starts itself when the car is turned on, (after setting up the connection of course). The disclaimer goes away on its own after about a minute. So far I haven't found a way to avoid the disclaimer screen every time it powers up. Annoying but it's still a great unit. You can wait and after about 30 seconds that window automatically disappears. What is the cold startup time? There is no provided specification for boot time. It is a very responsive stereo with a quality processor though. 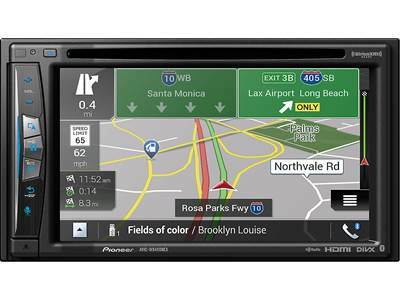 The Pioneer AVIC-W6400NEX has built-in GPS navigation — no phone required.